Film and television almost always gets aliens totally wrong. They usually walk on two legs, have two arms, and a head with a mouth, a nose, and two eyes. Maybe they have scales or pointy ears, but they otherwise look like what they are, a human in make-up. Nature has a much more wild imagination than we do. 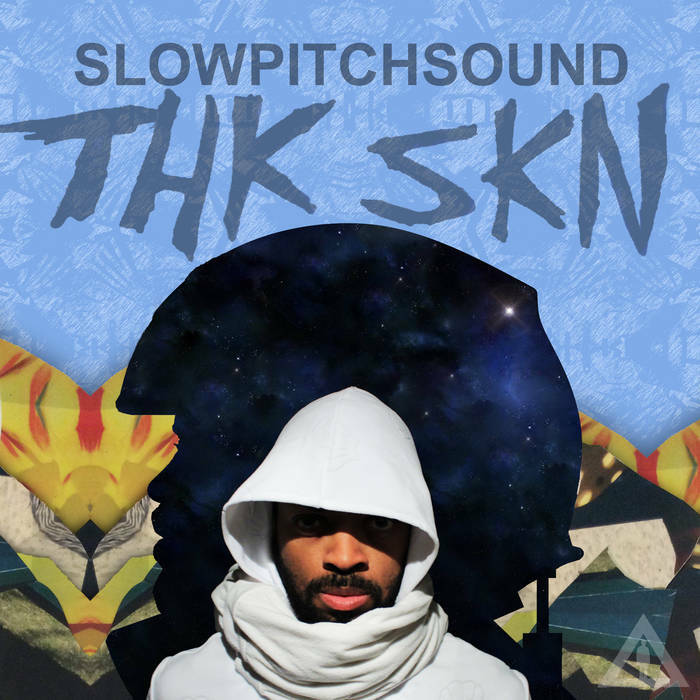 As I listened to THK SKN, the newest cinematic sci-fi excursion from turntablist SlowPitchSound, I felt like my imagination got a little boost, as I envisioned all the far out creatures slithering and creeping through its ambient landscapes. The record opens in the first light of an otherworldly dawn, as a computerized voice prepares you for your imminent journey. Then a heavy, plodding beat drops in, like the footsteps of a crash-landed astronaut trudging through the dunes of a harsh desert world. The first act is however not entirely without a human element, featuring some elegant vocals from Shikha Sehgal. Track one is rounded out by a close encounter with some eerie strings, and some broken glass blowing across concrete. Act Two immediately has a more mechanical feel, like it’s a recording from the inside of a droid factory. Yet a recurrent theme here is the persistence of nature, whether it’s gently babbling water, or the chirping of bird during a sudden power outage. But then the machinery comes back online, and the robots get back to work reshaping your mind and body into something that is no longer fully human. At least that’s what I imagined. As for what you might discover, you’ll have to put on your spacesuit and explore the world of SlowPitchSound for your self. Top Track: Best experienced front to back, in the dark with twirling coloured lights.